Ruskoh is a quad, very much normal african-dog-like bone-gatherer for my pet Daeti. He roams mystery island digging up/fetching bones and twigs that Daeti uses in her potions. Simple enough, but I CANNOT figure out a petpet for him, and he looks so naked without one! And it's been 397 days of not being able to decide XD SO I NEED YOUR HELP! I can go either or with colours or personality matching - my pet Daeti has a green symol because I'd always imagined her being helped by a semi-blind mole who was really in touch with the textures and smells of ingredients. Squidlas the maraquan acara has a marquan grackle bug cos it looks like an adorable depressed lobster. Which cracked me up. Currently the camelior is the only one I've found with a 'helpful' personality - that is, it can hold stuff with its tail and hands so that could be useful for holding bones, but iunno. Re: Petpet match for a spotted lupe! 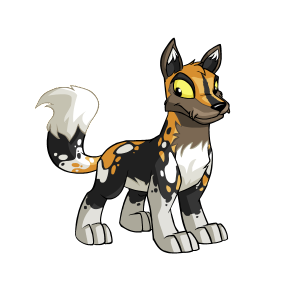 Sklydes are some of my favorite petpets. Maybe not what you're looking for, but at least a thought. Might I suggest a Juma? It's a fellow canine (albeit of a Foxy variety) and seems to have the same colour palette as the Spotted Lupe. I've never seen the first petpet you listed. It looks so oddly unNeopets-like. Almost like something from Chris Sanders. I think it's the chubby hands with the droopy nubs. I would go with that one, even though the zebie is cute. A cute mongrel that delights in finding small treats for your Neopet! This pretty puppy will fetch anything that is thrown for it. It eats almost anything! It loves children, too! Not exactly known on their burrowing or fetching skills, but another friendly puppy choice. Maybe Ruskoh believes that keeping this creatures around, he might have more luck on his quests, maybe they were a gift from his shaman apprentice friend Daeti, specially charmed for him. Reanimated bones or just lucky finds that Ruskoh decided to keep for himself?